This is the new AT10 II from Radiolink, fully featured transmitter and receiver bundle offering the latest technology at an amazing price. 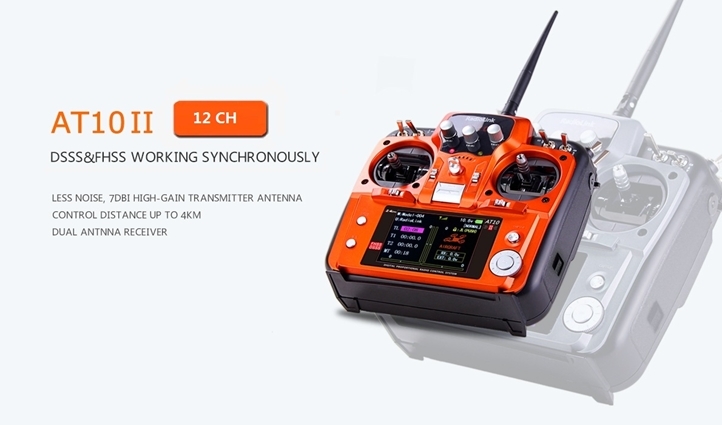 Its dual antenna receiver offers an impressive maximum control range of up to 4km, perfect for professional aerial drones or FPV racing drones. It has 7 customisable channels ontop of the 5 standard and features a 3.5inch colour LCD for setup and telemetry information. Included in the kit is the R12DS 12 channel receiver and a PRM voltage monitor for returning telemetry data back to the transmitter. The new receiver features twin antennas utilising diversity technology for a maximum range of 4km. The AT10ii improves on the latency of its predecessor, now taking just 3ms for the 10 channels to respond synchronously! Multiple alarms can be set for transmitter voltage, reciever voltage and more to provide feedback without needing to take your eyes from the craft. It supports both SBUS AND PWM signal outputs simultaneously. Custom throttle and servo curves can be adjusted via the programmable mix control. The side micro USB port is reserved for firmware updates, available from the Radiolink website. 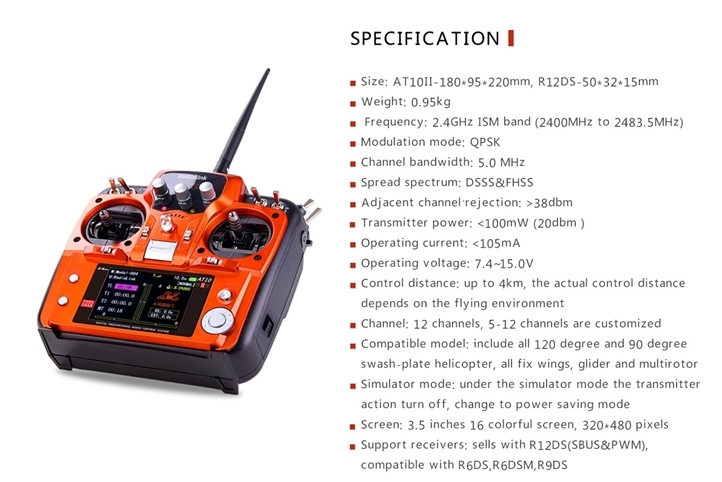 The transmitter's colour display can show signal strength, speed, throttle position, flight mode, GPS satellite connectivity, latitude and longitude, altitude, pitch, roll, yaw, distance from transmitter and much more. It also includes a RPM battery voltage telemetry sensor (the grey box pictured) which feedbacks voltage information from your battery into the receiver, which in turn sends the data for telemetry readout on the transmitter. This module weighs just 11g and measures 40mm x 2.7mm x 13mm. Like other Radiolink products, power can be provided by AA batteries, in this case 8 of them. But the battery holder can be unplugged via its JST plug leaving space for a LiPo battery. Better yet the power circuitry is protected, so plugging the JST connector of your transmitter battery in incorrectly will not cause a short circuit (simply remove and re-insert correctly). The transmitter consumes just 105mA in operation and has a mode switching power supply allowing it to support 2S-4S batteries. It is efficient with its power usage, you can expect 12hrs+ service from an 1800mAh 3S LiPo.